China is turning to foreign robotics and smart factory technologies to enhance competitiveness as it seeks to close the gap in manufacturing prowess with Japan and Germany by 2035 under Premier Li Keqiang’s “Made in China” strategy. 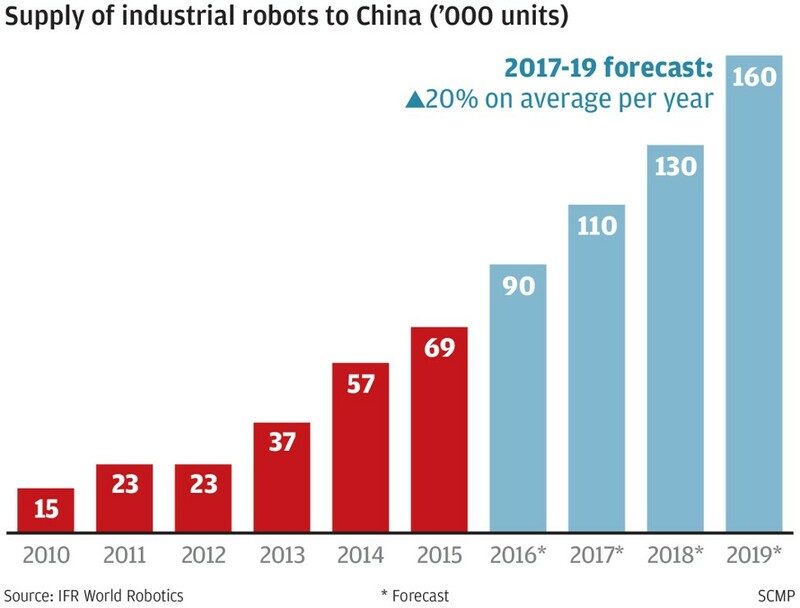 Faced with rising labour costs owing to its shrinking labour force, China has already overtaken Japan as the world’s largest industrial robot market. Industrial robot sales in China this year are estimated to reach US$4.2 billion, according to the Chinese Institute of Electronics. But a lack of core technology means the nation has been highly dependent on foreign supply. 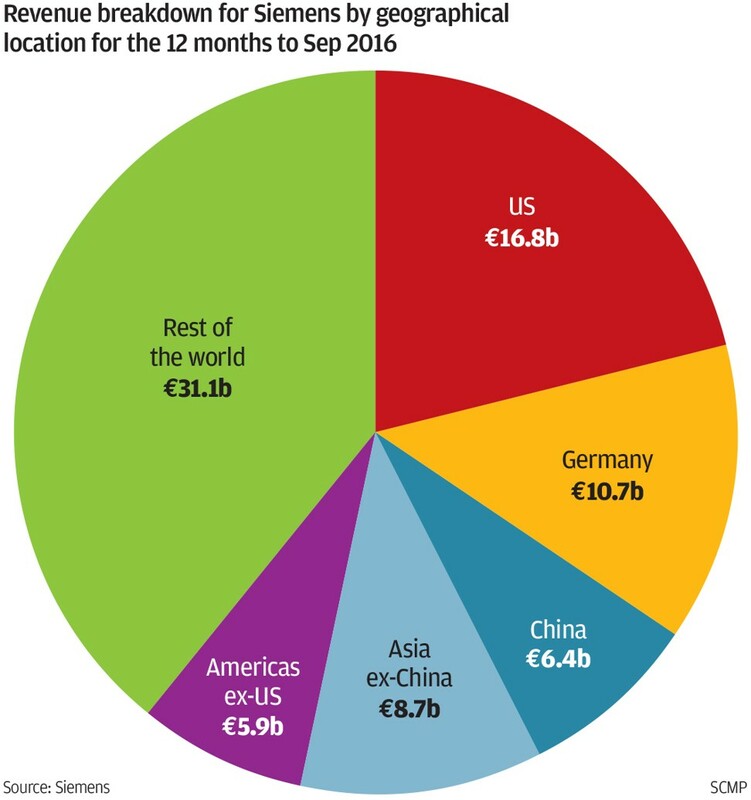 Imports from well established overseas major producers such as Swedish-Swiss firm ABB, Germany’s Kuka, and Japan’s Fanuc and Yaskawa Electric account for more than 60 per cent of all robots bought by Chinese manufacturers. For specialised six-axis robots, which provide greater flexibility and applications than earlier generations, overseas manufacturers account for 90 per cent of market share in China, according to a Huatai Securities research report. In a move that signals the growing importance of the mainland market, German industrial giant Siemens said last week that its China subsidiary will lead the company’s global effort in research in autonomous robotics. Siemens said its robot research centre will begin operating later this year at Tsinghua University in Beijing. The 170 year-old company, which entered the China market by introducing the electric pointer telegraph in 1872, does not make robots itself, but supplies hardware and software that controls them. The Chinese robot market is forecast to grow at an average annual rate of 23.4 per cent in the four years to 2019, much faster than global shipment growth of 13 per cent, according to the International Federation of Robotics. This means 39 per cent of new supply could go to China in 2019, up from 27 per cent in 2015. The need to upgrade and automate factory facilities is driven both by rising production costs and changing consumer demand. China’s labour force is forecast to contract by about 10 million each year for the next eight years, stoking inflationary pressures on wages, Huatai Securities’ analysts said. China’s labour costs have risen at an average annual rate of 12.3 per cent between 2010 and 2015, before easing to around 7.5 per cent last year. Meanwhile, since hitting a peak in 2013, equipment costs have been easing, effectively lowering the entry barrier for factories seeking to automate or update existing robot operations. New generations of industrial robots are more nimble, intelligent and can collaborate with other robots and humans, thanks to artificial intelligence and machine learning technologies. “They will be smaller and better at performing particular tasks, since they have more sensors to collect data and control operations,” Busch said. The share of tasks performed by robots is projected to rise to 25 per cent across all manufacturing industries by 2025, from 10 per cent in 2015, according to a report by the Boston Consulting Group. The improvement will slash average manufacturing labour costs by 18 to 25 per cent in China, Germany, US and Japan, the report said. Robot adoption should also be seen as a benefit in enhancing efficiency, reduce human error and releasing workers from mundane tasks. “Smart” factory and production lines collect and analyse data, enabling managers to make better decisions to optimise operations. The concept refers to the ability to independently exchange and respond to information to manage the production processes. 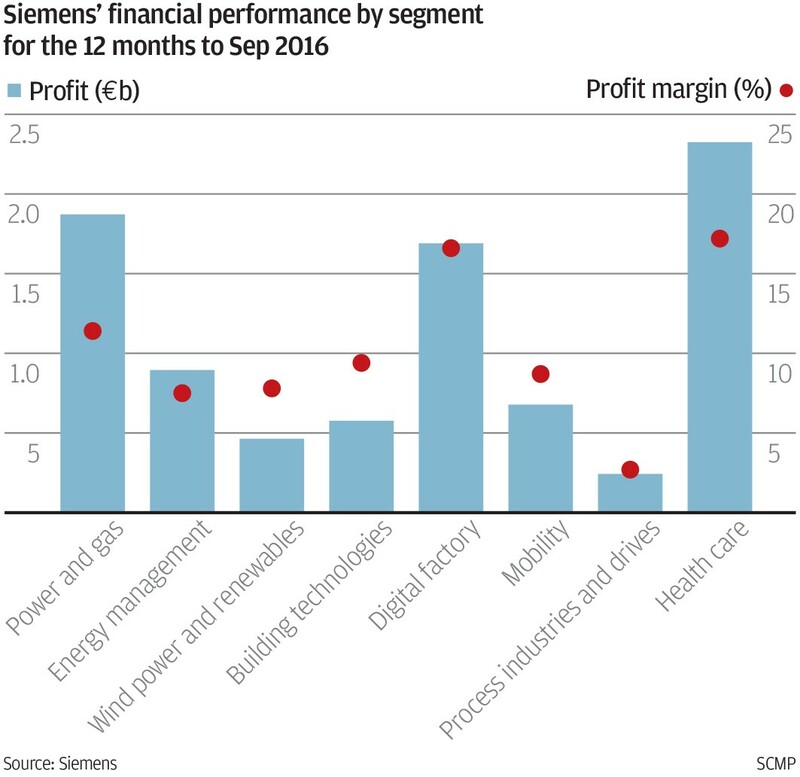 Siemens’ “digital factory” division, which sells solutions for improving manufacturing flexibility and efficiencies, booked net profit of €1.69 billion (HK$15.8 billion), the third biggest profit contributor in the company in the 12 months to September 30 last year. The division’s net profit margin of 16.6 per cent was also the second highest in the company after health care and excluding financial services. Robotics and digitisation are part of strategies outlined in the “Made in China 2025” plan unveiled by Premier Li Keqiang in 2015. Other technologies highlighted in the plan include 3D printing, big data analytics, bioengineering, new energy and new materials. Li aims to transform China into “strong” manufacturing nation in a decade, and match the strengths of Germany and Japan as leading innovators in certain industries in two decades. While Beijing has ploughed 900 million yuan to support the 3D printing industry, most of the progress remains in the research stage, with limited commercialisation. “There are plenty of 3D printing companies in China, but the largest one has a market capitalisation of just over 2 billion yuan, 10 to 20 times smaller than its global rivals,” said Huang Weidong, president of Xi’an Bright Additive Technologies, a 3D printing technology supplier. Li’s 2025 plan is often discussed together with “Industrie 4.0”, the strategic initiative adopted by Germany in 2010 to establish the nation as a provider of advanced manufacturing solutions. The initiative aims to shift German manufacturing towards a “decentralised, autonomous and smart” model. “China’s Made in China 2025 strategy is different from Germany’s Industrie 4.0 in the sense that the Chinese strategy is more target oriented,” said Wu Cheng, a professor at Tsinghua University’s department of automation and the director of State CIMS Engineering Research Centre. China aims to shift from low value added activities to quality medium to high end products under national brands. To help achieve this goal, Beijing has encouraged companies to spend an average of 1.6 per cent of sales on research and development by 2025, up from 0.95 per cent in 2015. The world’s top 1,000 corporate investors on research and development had an average R&D spending ratio of 3.7 per cent in 2015, according to accounting and consulting firm PwC.